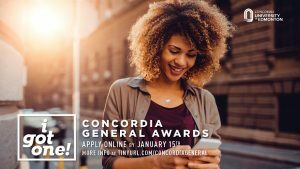 Concordia General Awards – Apply Now! APPLY NOW for the 2018-2019 Concordia General Awards competition. This annual awards competition includes 50+ donor-funded awards. Undergraduate degree students enrolled full-time for fall and winter terms may apply through OnlineServices for Students by January 15, 2019. For more information and a list of awards, please read the Frequently Asked Questions.